To see if Reginald Low is accepting new patients, or for assistance finding a UC Davis doctor, please call 800-2-UCDAVIS (800-282-3284). Reginald Low is a nationally recognized clinical investigator in cardiology who incorporates the best of leading-edge technology with the highest quality of patient care. 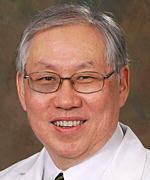 His research focuses on coronary artery disease and developing minimally invasive methods of diagnosis and treatment. Treede H, Tubler T, Reichenspurner H, Grube E, Pascotto A, Franzen O, Mueller R, Low R, Bolling SF, Meinertz T, Schofer J. Six-month results of a repositionable and retrievable pericardial valve for transcatheter aortic valve replacement: the Direct Flow Medical aortic valve. J Thorac Cardiovasc Surg 2010 Oct;140(4):897-903.
feldman T, Kar S, Rinaldi M, Fail P, Hermiller J, Smalling R, Whitlow PL, Gray W, Low R, Herrmann HC, Lim S, Foster E, Glower D, for the EVEREST Investigators. Percutaneous mitral repair with the MitraClip system: safety and midterm durability in the initial EVEREST (endovascular Valve Edge-to-Edge REpair Study) cohort. Journal of the American College of Cardiology 2009; 54:686-694. Li N, liu JY, Timofeyev V, Qiu H, Hwang SH, Tuteja D, Lu L, Yang J, Mochida H, Low R, Hammock BD, Chiamvimonvat N. Beneficial effects of soluble epoxide hydrolase inhibitors in myocardial infarction model: Insight gained using metabolomic approaches. J Mol Cell Cardiol 2009 Dec;47(6):835-45. Rogers JH, Rahdert DA, Caputo GR, Takeda PA, Palacios IF, Tio FO, Taylor EA, Low RI. Long-term safety and durability of percutaneous septal sinus shortening (The PS2 System) in an ovine model. Catherization and Cardiovascular Interventions 2009; 73:540-548. Taneja M, Tay KH, sebastian M, Pasupathy S, Lin SE, Teo T, Low R, Irani FG, Chng SP, Dewan A, Tan BS. Self-expanding nitinol stents in recanalisation of long-length superficial femoral artery occlusions in patients with critical limb ischaemia. Singapore Med J 2009 Dec;50(12):1184-8. Low RI, Bolling SF, Yeo KK, Ebner A. Direct flow medical percutaneous aortic valve: proof of concept. EuroIntervetion 2008;4(2):256-261.